DOWNING Street has announced that the Ven Peter Hancock will be the new Bishop of Basingstoke. Peter, who has been Archdeacon of the Meon for 11 years, will be consecrated as a bishop at St Paul’s Cathedral in September. He’ll be a suffragan bishop working in the neighbouring Diocese of Winchester. His appointment was announced at a press conference in Basingstoke on June 22, after which he toured all seven of the deaneries that he will be responsible for. He met clergy and worshippers, dropped into a shopping centre, visited Sparsholt Agricultural College, and travelled on the Alresford steam railway. “Having grown up and worked in the Portsmouth diocese for so long, it’s a real wrench to leave,” he said. “There are very few churches that I haven’t visited, presided or preached in. It’s been a joy and privilege to work alongside Bishop Kenneth and I’m sad that I won’t have the opportunity to work alongside Bishop Christopher in this diocese. The Ven Peter Hancock, now 54, grew up on the Isle of Wight, living in Ryde and Lake and going to a church school until he was 11. His family moved to Fareham and he made a Christian commitment at Holy Rood Church, Stubbington, as a teenager. He attended Cambridge University and Oak Hill Theological College before he was ordained in our cathedral aged 25. 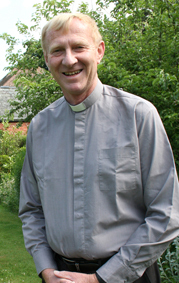 After serving as a curate at Christ Church, Portsdown, and then at Radipole and Melcombe team ministry in Salisbury diocese, he became vicar of St Wilfrid’s, Cowplain, from 1987 until 1999. There he oversaw a £700,000 project to expand the church and provide a church hall, developed a church plant and saw congregation numbers expand significantly. He became the first Archdeacon of the Meon in 1999 and has also spent time as acting Archdeacon of the Isle of Wight and Warden of Readers. He oversaw the work of mission in our diocese for three years and now chairs the Mission and Discipleship Forum. He is chairman of trustees for the Church Pastoral Aid Society. He is married to Jane and they have four children. There will be a farewell Evensong for Peter at our cathedral at 6pm on September 5. His consecration will be on September 21 and there will be a formal service of welcome in Winchester Cathedral on October 2. His new role will involve him sharing episcopal oversight of the north of Winchester diocese with the Bishop of Winchester. It’s a mostly rural area served by 93 clergy and 195 churches, and includes Basingstoke, Andover and Winchester itself.